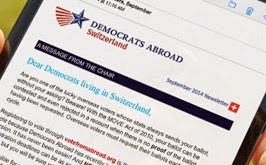 Democrats Abroad Switzerland: Conference - U.S. elections 2012: Will the debates change the game? Conference - U.S. elections 2012: Will the debates change the game? Barack Obama or Mitt Romney; what will determine the outcome of the 2012 presidential elections in the United States of America? Will it depend on the debates, the economy, on ideology, or on money for the campaign? Join us for a discussion with David Sylvan, Professor of Political Science and American foreign policy expert at the Graduate Institute of International and Development Studies. He will examine different political science models of forecasting the election and focusing on who is likely to win. David Sylvan has been a faculty member since 1991. He is the co-author of US Foreign Policy in Perspective (2009). His teaching and research focus on methodology and on US foreign policy, among other matters. The event takes place on the same day as the next debate between Barack Obama and Mitt Romney.